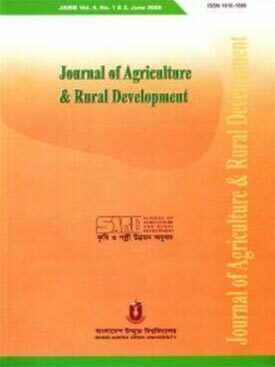 Journal of Agriculture & Rural Development is published form School of Agriculture and Rural Development, Bangladesh Open University, Gazipur-1705, Bangladesh. ISSN of this journal is 1810-1860. The journal publishes original research papers, short communications, review papers/articles, case studies and book reviews in the field of distance education (in agriculture and applied sciences), agribusiness, agricultural engineering, animal science, crop science, fisheries science, forestry, environmental science, rural and youth development, veterinary science and related fields. The journal is currently available online at http://www.banglajol.info/index.php/jard. Two copies of the manuscript typed on A4 size offset paper with double space and adequate margins (left and top 3.80 cm, right and bottom 2.54 cm) should be submitted. All pages should be numbered on the top (title page is 1). The article should not exceed 10 journal pages with Figures and Tables. Submission is representation that the manuscript has not been published previously and is not under consideration for publication elsewhere. A covering letter should clearly identify the person (with address, fax, telephone number and e-mail address) responsible for correspondence. Elements comprising the manuscripts should be ordered as follows: Title page, Abstract, Keywords, Introduction, Materials and Methods, Results, Discussion, Conclusions, Acknowledgements, Literature cited, Tables and Figures caption list. Title page: This should include the title of the article, authors’ names and affiliations, complete mailing address, fax, e-mail and telephone number of one of the author who will review the proof and suggested running head. Abstract: This should be on the 2nd page of the manuscript. Title should also be written on the top of the abstract. The abstract should be written within 150 words. Keywords: A list of 3-6 key words is to be provided directly below the abstract. Key words should express the precise content of the manuscript and consists of words or phrases. Acknowledgements: All acknowledgements (including those for grant and financial support) should be typed in one separate paragraph that directly precedes the reference section. Sardar, M. A. and Sarker, K. R. 1988. Bioassay of pesticides on the life stages of red mite, Tetranychus bioculatus (Wood-Mason) (Prostigmata : Tetranychidae). Acarologia 29 (3), 279-284. Mollah, J. U. and Islam, W. 2003. Insecticidal activity of Ipomoea maximum L. against the pulse beetle, Callososrmchus maculatus F. J Agric Rural Dev 1(2), 49-54. Publiese, R. 1995. The loneliness of the distance learner. In “Invitational Research Symposium on Distance Education”. American Center for the study of Distance Education, The Pennsylvania State University. pp. 220-225. Chin, K. S. 2000. Introduction to quail farming. (2000, February 16). Anisul, H. 2003. 03 August 2003. Success in the production of test-tube baby . In “The Daily Star”, Dhaka. p. 4. Gill, J. S. 2004. Weed management for improved crop production. In “Far Eastern Agriculture”, 2 (2), 16-17. Nakamura, M. 1990. A Livestock and Poultry Disease Control Programme for Bangladesh, USAID/BRAC, Dhaka. pp. 23-25. Alam, A. K. M. A. 2001. Studies on the quality of vegetable seeds available in the market. Unpublished [MS Thesis], Department of Horticulture, Bangladesh Agricultural University, Mymensingh. 50 pp. Snodgrass, R. E. 1994. “Principles of Insect Morphology”, McGraw Hill Book Company, USA. 364 pp. Simpson, K. and Day, N. 1996. “The Princeton Field Guide to the Birds of Australia.” Princeton University Press, New Jersey. 511 pp. Cohen, S., Ward, P. A. and Bigazzi, P. E. 1974. “Mechanisms of Cell-mediated Immunity” (R. T. McCluskey and S. Cohen, Eds.). J Wiley and Sons, New York. 600 pp. Clark, L. R., Geier, P. W., Hughes, R. D. and Morris, R. F. 1982. Numerical change in insect populations. In “The Ecology of Insect Populations in Theory and Practice” (L. R. Clark, P. W. Geier, R. D. Hughes and R. R. Morris, Eds. ), Methuen & Co. Ltd. USA. pp. 7-25. Wooding, F. B. P. and Flint, A. P. F. 1994. Placentation. In “Marshall’s Physiology of Reproduction” (G. E. Lamming, Ed. ), Vol. 3, Pregnancy and Lactation, Part One, Ovulation and early pregnancy, Chapman & Hall, London. pp. 233-460. Tables: Tables should be typed on different sheets and numbered consecutively with Roman numerals. Tables should be self-explanatory and includes a brief descriptive title. Illustrations/Figures/Photographs: Illustrations should be drawn or with computer and be in a form ready for plating. A brief legend should be provided for every diagram and photograph on a separate sheet of paper and should not be incorporated in the figure. The illustrations should be numbered on the back with a pencil. The place of inclusions of the figures in the text should be clearly indicated. Figures should be numbered in the order in which they are mentioned in the text. Photographs should be clear, black and white on glossy print. Number of tables, illustrations and photographs should be kept at absolute minimum. Same results should not be presented both in tables and figures. Short Communications: Short Communications should contain short description of objective of the work, materials and methods and results and discussion without any headings. Literature cited will be included under the respective heading. Short communications are concise manuscripts of two or less journal pages i.e. about 3-5 pages of A4 size paper including Tables and Figures. All measurements must be given in metric units. Authors will receive galley proofs, which they are requested to correct and return as soon as possible. New matter should not be inserted in the text at the time of proof reading. Both hard copy and CD typed in MS Word should be submitted. No paper will be accepted for publication if it is not prepared following the style specified for the journal. Recent issues of the journal may be consulted for style. Visited 665 times, 1 visits today | Have any fisheries relevant question?